Nicolas M Kyvernitis Enterprises (NMK), the distributor of Williams Sound in the Middle East, has supplied Digi-Wave Wireless Intercom System to Simtran Technology Systems. Simtran, a specialist supplier of simultaneous interpretation and conference management systems, was looking for a system that would allow for the provision of interpretation of presentations being made in different areas during events, without having to temporarily install booths, transmitters and radiators in each area. For certain applications, a simpler, more portable solution was needed in order to provide the same high level of service but with that extra flexibility. NMK introduced Williams Sound to Simtran and provided them with a Digi-Wave demo kit to test. “On using the kit we were impressed with the quality of the actual product as well as the general ‘look and feel’ of the manufacturer as a whole and their commitment to providing a wide range of high end products in various market segments. We compared the Digi-Wave system with a couple of other brands in the market and thought it would give us the most flexibility moving forward in terms of applications it could cover. Despite its slightly higher cost in comparison with the other options the system still seemed to provide the best ROI, something we have to bear in mind in a very competitive market,” commented Antony Lovell, General Manager at Simtran. 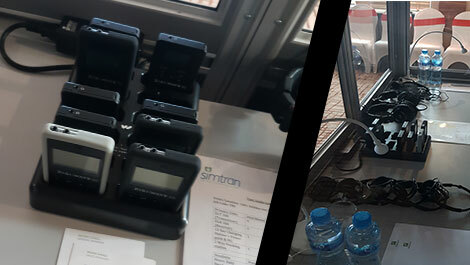 Based on the demo session and positive feedback from its team Dubai based Simtran purchased the Digi-Wave 300 series consisting of DLT 300 Digital Transceivers and DLR 360 Digital Receivers to fulfill the requirement. “To date we have successfully used the system on a handful of occasions with three different clients. Both end users as well as the interpreters employed on the jobs were able to use the system with very simple introduction and no issues. This ease of use factor is very important as there is no point in providing a system that isn’t intuitive and user friendly to clients who may only use it once a year. From a traditional conference setup in a five star hotel to an event that took place over various outdoor venues at a race track, the system has proven itself up to the job. It is certainly not intended to replace our existing stock, but provide a different solution for certain applications.” Mr. Lovell added. Simtran Technology Systems answers a growing requirement for professional conference management and simultaneous interpretation services within both the United Arab Emirates and the region as a whole. The company stocks a wide array of market leading products including DIS and Shure equipment as the mainstay of their rental offering.